Interrogating life seems rather an insurmountable challenge to embark upon. One which comes with no guidebook or answer sheet to fall upon in defeat. Biologists, astronomists, physicists, theologists- there exists a whole array of expert-“isms,” all interrogating life professionally on a daily basis, probing for a definitive understanding of life for mankind. Chagall’s conviction in the validity of this interior world is vital to his works, as he struggled to unite it with what he saw around him. Memories, his rural hometown, childhood traditions and Jewish folklore all strive to exist in the face of Paris’s fast-paced modernity.”Paris Through The Window” (1913) and “Painter at the Easel” (1914) both show the distinct separation yet irrevocable interaction of these two worlds. They represent a schism in Chagall’s very existence – an inescapable split in both loyalties and identities. At the heart of Paris, both figures sit isolated from the thriving city, absorbed in thoughts and memories while the external lingers faintly through the distant window. It’s as though Sylvia Plath transcribed these very paintings into words when she wrote in 1963 “The city hung in my window, flat as a poster, glittering and blinking, but it might just as well not have been there at all, for all the good it did me.” Trapped inside the airless “bell jar,” her protagonist’s perspective becomes so distorted that she is no longer able to connect with the physical world around her. 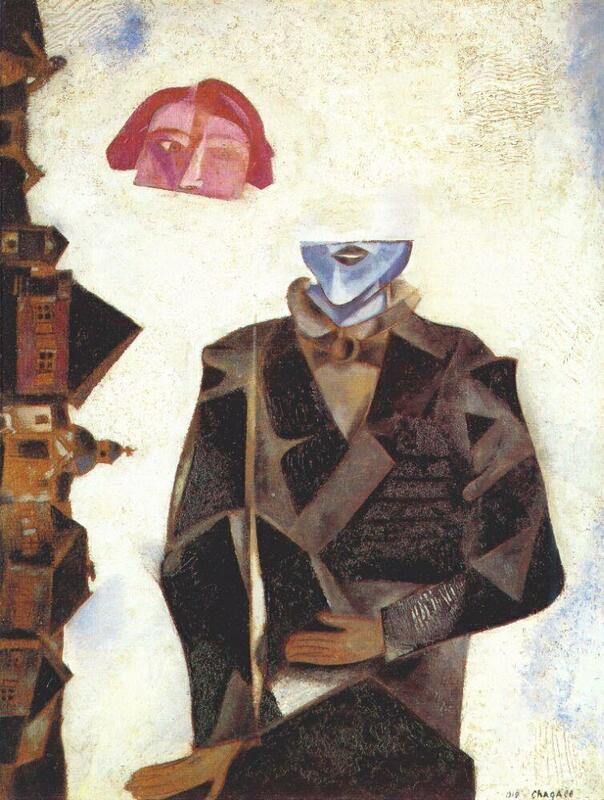 Caught between these two opposing worlds, unable to fully devote themselves to either, Chagall’s characters recoil from the organised reality surrounding them, searching instead for a purer truth. While this may evoke spirituality or religion of some sort, Chagall denounces the possibility of achieving this through a life defined by faith and prayer. 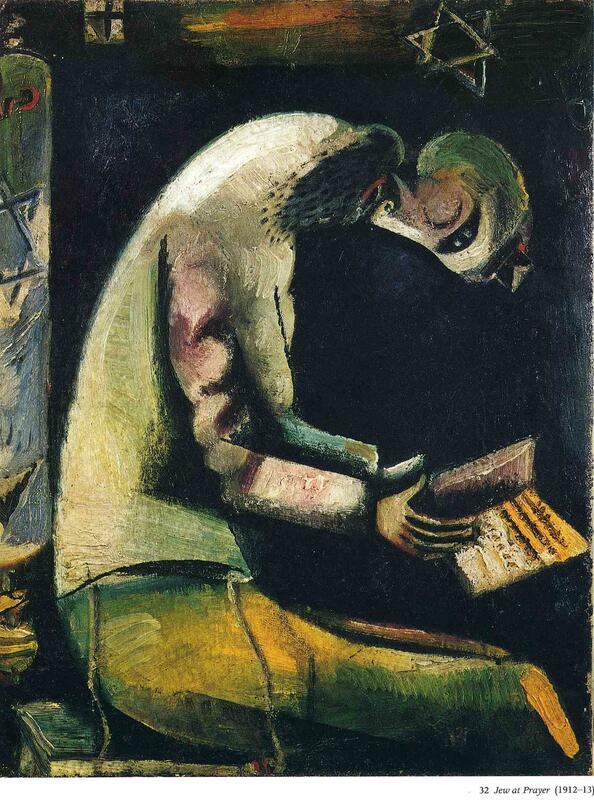 “Jew At Prayer” (1912/13) shows a practicing Jew bent over the Tanakh in ritual. Yet, the face quickly becomes distorted to the viewer, as the eye of the worshipping face morphs into a grinning mouth and its right cheek blends into the dark cosmos, searching for meaning independent of the scripture. “Anywhere Out Of The World” (1915) expands this idea of transcending these established forms of existence and identity, as the figure’s mind is literally detached from the rest of his body, floating away into the air. “The Painter To The Moon” (1917) and “Man WIth Head Thrown Back” (1919) embrace this as the characters turn away completely from the world beneath their feet to peer up at the sky with awe and longing. The “Modern Masters” exhibition lays out Chagall’s progress through early life, a young man affected deeply by the absurd dualism of existence, caught between two worlds – geographically, spiritually, emotionally. To me, it’s the story of many. Breaking free from the familiarity of his childhood, he moves into the unknown, quenching his thirst for understanding, feeding greedily on the grass that seems so lush and green. Yet rather than becoming clearer, an ever mounting catalogue of experiences and realisations yields confusion. A cluttered city and a cluttered mind. He depicts the pivotal moment at which he begins to search for meaning somewhere deeper – probing for something unique and exclusive to himself, something only he can truly know. 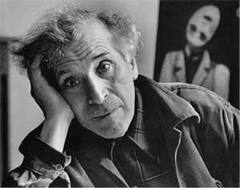 Chagall interrogates his own life, presenting to us his most personal interpretation in all its pain and beauty. And it’s story to which we can all relate. Next articleContemporary ArtNi Haifeng's "Para-Production"